The home workshop can be a valuable asset - not only for expressing your creative side but for saving money when it comes to home repairs. A home workshop, complete with basic tools, has value for the journeyman carpenter as well as the weekend handyman. The basic tools for a home workshop to be used for everyday home maintenance are as follows. Before you begin shopping for basic tools for a home workshop, consider where your workshop will be, and how you are going to store your tools. The workbench and tool storage are as important as the basic workshop tools themselves. Safety first! Have a first aid kit front and center, even when you begin building your collection of tools. Make a first aid kit your first purchase. Safety glasses should be available at all times. Choose the location for your home workshop. A spare room, garage, garden house or other location. A location with direct access to the outdoors is preferable, for both ventilation and ease of loading and transporting both tools and project supplies. If your workbench can be situated in a room with a door, better yet. A workshop door can locked to keep out children who should stay away from power tools and sharp hand tools for safety reasons. Remember: there is always the garage, "the old favorite escape for those who tinker." 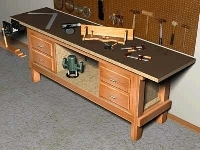 Select a home workshop bench that fits the space that you will be working in. There should be adequate room to move freely, to bend, and to maneuver large sheets of plywood or other materials. Your workshop bench should be equipped with a bench vise to hold items that you are cutting and working on. Now you are ready to begin selecting the basic tools for a home workshop. General carpentry hand tools are used to do household trim projects and repairs. These should include a variety of hammers, a handsaw, dove-tail saw, trim-back saw, tape measure, a 2-foot frame square, pry bar, speed square, awl, nail set, tin snips, hack saw, utility knife, carpenters pencils, chalk line, sanding block, level, bar clamps, chisels, block plane, drill bits, countersink bits, and a variety of fasteners. General carpentry power tools are another component of the basic tools for a home workshop. Power tools should include an electric miter saw, electric table saw, electric drill, electric screw gun, electric jig saw, electric sander, electric sawz-all, shop vacuum, saw blades and screw driver tips. An air compressor can be added to your collection of power tools. The air compressor is used for pneumatic air tools such as power nailers. Select battery-driven tools for convenience. Battery powered power tools allow you to without extension cords. Almost all of the above power tools are available with battery power. General electric tools for your workshop should include a circuit tester, wire cutters, wire strippers, a fish tape and pliers. Designate a shelf in your storage area for electric supplies. General plumbing tools that your home workshop should not be without are an assortment of pipe wrenches, basin wrench, a small torch, solder, copper brushes, emery cloth. Leave a drawer for miscellaneous plumbing supplies, which you can gradually add to your collection of basic tools for a home workshop. Basic mechanical tools needed for everyday home and auto repair are adjustable wrenches, an allen wrench set, screwdriver set, open-end wrench set, socket set and a floor jack. A large retail tool store, brand name online store, or home improvement store - and their staff - can be a asset when deciding on the basic workshop tools for your home projects. Enlist their expertise in selecting those tools that best suit the type of projects you will be taking on. Beware: working on special projects and the endless amount of specialty tools available can drain your wallet. Add tools to your gift lists, drop hints at home, and watch for seasonal specials, coupons and home maintenance store promotions. Evaluate whether purchasing basic workshop tools individually, or as a set, is most economical. Make a list of the tools need before you start a project, and do an inventory of workshop. Add basic workshop tools as you need them. The situation that you must avoid is being caught mid-project without a specific tool or fastener that you need.